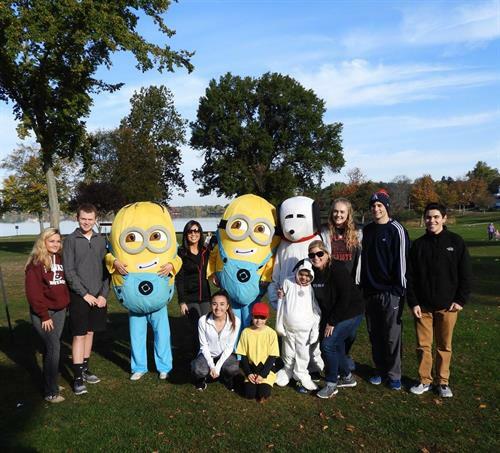 12th Annual Steps2Cure NF Walk & 5K Road Race - Oct 21, 2018 - Burlington Area Chamber of Commerce ? Steps2Cure NF is a 3 mile walk and/or officially timed run around beautiful Lake Quannapowitt in Wakefield, MA. This is a popular annual event where NF patients, families and friends come together to raise funds, create awareness and participate in Neurofibromatosis Northeast's largest walk! There will be food and fun, music, raffles, face painting, the always exciting Kids Dash, plus many Halloween Treats (costumes are encouraged!) WCVB is the exclusive television sponsor of the event and we are thrilled to welcome back Antoinette Antonio, co-anchor of WCVB?s Channel 5 EyeOpener as Master of Ceremonies of the event! Don?t miss out! Form your team now, or register as an individual. If you can?t participate in person, we encourage you to join us in the fight against neurofibromatosis by fundraising and walking or running at your home! Virtual Walkers/Runners can be team captains, members of teams, participate in fundraising contests and become top fundraisers! We will even send you a t-shirt! Neurofibromatosis (NF) is a genetic tumor disorder that causes tumors to form on the nerves anywhere in or on the body at any time. NF affects 3 times as many people as cystic fibrosis and muscular dystrophy combined, yet it is not commonly known and there are no means of prevention, no effective treatment and no cure. Scientists have determined that NF research has broad implications for millions of Americans who are affected by hearing loss, visual impairment, cancer, brain tumors, seizures and learning disabilities, all of which can be symptomatic of NF. Proceeds from the Walk & 5K Road Race and raffle will benefit Neurofibromatosis Northeast, a Burlington, MA based non-profit organization. Funds raised will make it possible for the organization to invest in NF research at premier scientific institutions. In addition, donations help the organization assist the many families dealing with neurofibromatosis by providing information and support as well as provide college scholarships for students who have NF to continue their education after high school. *Register early and get $5 off your registration fee! *Free t-shirts while supplies last!